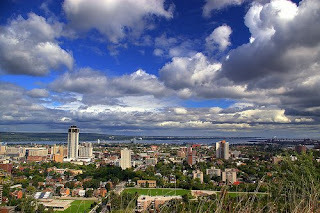 Here it is, the scenary of Hamilton, the destination which I'm heading to after struggling almost 1 year in ICPU. Well, the picture look nice though. I think that even my sight cannot see clearly the real scenary as a see this picture. Wikipedia states that there are 3.3% of South East Asia ethnicities in Hamilton. (ramai la tu, arabs: 1.1%) So, I think there will be no problem for us to study there. congrats, finally, you get what you want..
and i hope that is the best 4 you..
anas --> youre torontorian, arent u? hey!dont judge a book by its cover brader!canada is 1 of da most great scenery country ive been...do knw bout ur side....suggest u to go halifax...hawskesbury subport!peace man!damn beautifool!xpecially winter!huh.